Wearing masks to ward off spirits, or hide amongst spirits in a custom prevalent in more than 1 culture, how many of us have dressed up and used masks at Halloween? In South Korea the culture and history of the mask is celebrated once a year in the town of Andong, and the nearby folk village of Hahoe (pronounced Ha – Hway). The tradition of mask dance in Korea goes back centuries, and was used in shamanistic rituals. In the village of Hahoe the tradition of mask dancing goes back centuries and is preserved today by a mask dance team that performs “Mudong Madang” a dance where people make offering for health and wealth to a female goddess. This troupe then performs a second act called “chuji madang” where an abundant harvest is promised, and this is finished with a dancer chasing away demons and evil spirits. The stage has now been sanctified, and other acts follow. The festival also features performers from across Korea, and around the world. The international flavour is given to this event by performers who come from China, Mexico, France, Indonesia, Malaysia, Mongolia, and Thailand. Performance by these groups are scattered across Andong and Hahoe, and are performed several times over the course of the week long festival. The main festival site also offers people the chance to make there own mask, enjoy a fashion show with naturally dyed garments, and watch some younger mask dance performers in action. I felt for me the real charm of the area is the Hahoe folk village itself, and it’s little surprise to me that when foreign dignatories including the Queen of England and a former US president visited Korea they came here. The first thing to note is the stunning location on a bend in the Nakdong river, with the imposing Pyungdae rock face on the side of the river the villagers who have lived in this village all there lives are clearly blessed. Indeed the village has produced a former Korean prime minister, his name was Ryu Seongryong . 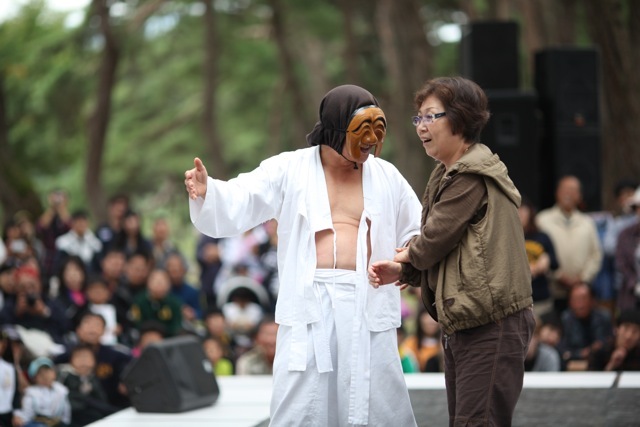 As well as all the mask dance performances that take place in Hahoe, with a lot of the performers making the trip from Andong itself, the high point of the festival is the Seonyujubul Nori. Seonyujubol Nori is something rather special to behold, and is a fire play performed on a boat along the river Naktong. In the past the custom was for poets to write poems and once one of these was finished people would shout “drop the fires”. Today there is just the one boat on the river with several people dressed in Hanbok serenading the watching crowd. The custom of dropping bundles of fire from the top of the cliff is still carried out as well. The true magic is perhaps provided by the traditional fireworks. Where western fireworks are all over in a flash and a bang these fireworks really romance the crowds as they drop little sparkles of fire rain on the river and beach for perhaps an hour. The fireworks are suspended across the river on for sets of wire which rather resemble a huge washing line. Once lit you can stand between these wire and have sparks fall either side of you, and yes it really does feel like fire rain. On arrival in Andong you’ll find a large festival site about 10 minutes walk from the bus terminal, and 15 minutes from the train station. Those who want to head onto Hahoe village need to cross the road and find the 46 bus, which takes 40 minutes to get to the village. Accomadations is fairly easy to find. The Andong park tourist hotel is 50000w a night, and is a 10 minutes walk from the bus station. There are also plenty of motels between the bus station and the tourist hotel. If you go to Hahoe you can stay over night at the village in one of the minbaks. Call the Travel Phone (+82-54-852-3588, +82-54-840-6974) for reservations.